Yesterday it was mentioned that some collectible category names are "all <collectible>" like all rampages and some start with the number like 100 hidden packages. And it was proposed to change that so all of them have the same style of naming. So here's the vote. The first collectible category was 100 packages in vc and not all packages, I want to keep the naming style we started with, because that is the way they are listed in the stat screen. Powdinet mentioned that if there was a way for duplicated pickups categories with a number name wouldn't work well, but that issue can be solved by adjusting the rules. And if that is the main reason to rename everything to start with all, we would need to rename the 100% to all % (with a space since all isn't a %) and drop the ingame from ingame 100% because it would be the real 100%. So if you support B, you support ingame hundo as the main 100% category. As mentioned above, there is the possibility that one day collectibles can be attained multiple times, or worse, spawn arbitrary collectibles. When mission duplicating was found, the definition for All Missions and 100% was adjusted to require every mission or every percentage to be awarded, and it was deemed that "the stats do not matter". Furthermore, there is a glitch in GTA 3 that allows the completion of all rampages without the stats indicating it (In fact, 100% runs end with the stats saying 18 out of 20 rampages completed). Worth noting that in VCS, 99 Luftballons should remain as the category name, because the number of balloons is deemed relevant enough that the developers went out of their way to include it in the congratulatory message, due to it being a reference to a song. "So if you support B, you support ingame hundo as the main 100% category"
This is not true. This is like saying "By supporting A, you support renaming GTA 3 All Missions to 73 Missions", because it has its own stat. Getting all individual packages is similar to getting all individual percentage points. The word "All" already means 100% of something, so no renaming is required, because 100% of 100% is still 100%. "The first collectible category was 100 packages in vc and not all packages, I want to keep the naming style we started with"
Just because we start doing something the wrong way, doesn't mean we need to keep doing it wrong. As such I vote B, though I would open the exception for 99 Luftballons (if exceptions aren't allowed, should be All Red Balloons). While saying "100 Packages" is synonymous with "All Packages", and most people know that 100 = all in this case, "All" is much more explicit as to what the goal is: you just get every single package there is, as opposed to just getting 100 packages (which also happens to be all of them). 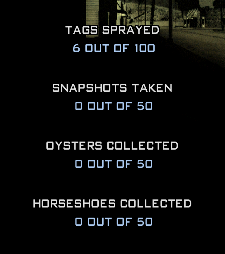 Powdinet also makes fair points about the number in the stats not counting correctly in GTA III, and how the games specifically say "all" themselves when you get all of a collectible. As for 100%, it feels like a different subject matter than collectibles. The rules do make it seem like you are getting all percentage-awarding objectives completed, but of course, the advent of duping meant a completely different category for stats menu 100%, and nobody wanted that to be the main 100% category, so we end up here. If you could dupe packages and the like, then that could be taken into account, but you can't, so I'll vote for B for now. I vote B, mostly because of possible future developments described by Powdinet and for leaderboards consistency. but i'll vote B to "support ingame hundo as the main 100% category"